También conocida como: Garnacha gris, Garnacha blanco, Garnatxa blanca, Grenacha Blanc & Lledoné. The Garnacha Blanca wine grape is a variety of white wine grape that comes from Aragón. It is extended in all Spain specially in Aragón and Tarragona, besides California and Australia. 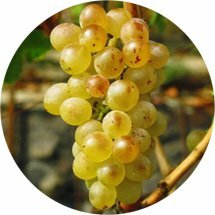 The Garnacha Blanca is used to make very fruity wines, either alone or mixed with other varieties, such as Parellada, Moscatel, Viura or Pedro Ximénez.